This is the second arson attack on buildings under construction in 2019 already, after there were over 25 attacks in 2018. The best proactive Applied Fire Science today is available to builders nation wide and all wood framed buildings need to defend 100 percent of the lumber during the framing stage or thay should be uninsurable from an arson attack loss. Showing up with water once lumber gains pace is never going to save the building from total loss, it saves other neighboring buildings only. •M-Fire is hoping this builders reaches out to us to fire defend there rebuild. We have a builder that now defends all there high density wood framed apartments after one of their buildings burned down twice. 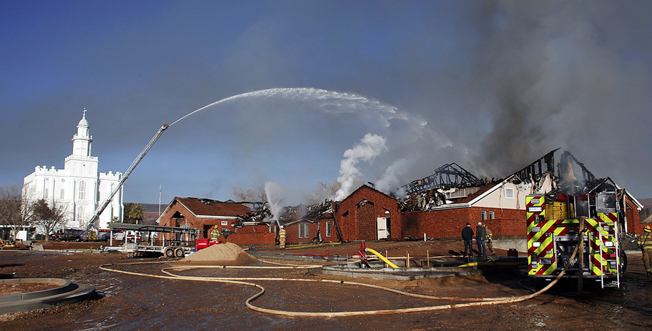 ST. GEORGE — A new stake center for the St. George East Stake of The Church of Jesus Christ of Latter-day Saints was heavily damaged by fire early Saturday.